Whether you love to craft and are looking for a new project or want to spruce up your home on a budget, you can easily update and personalize your home by taking on a DIY furniture project. Check out these simple ideas to give any room a fresh, new look. An old, wooden door can easily be repurposed into a chic headboard for your bed. Find a door to repurpose, or buy an unfinished one from the hardware store, and add crown molding to one long edge of the door to create the top of the frame. Then paint it to match your style, and screw it to your bedframe for a unique and homey headboard. If your bed frame won’t accommodate the new headboard, mount it to the wall behind your bed to get the effect of a headboard without all the hassle. Is your dresser too old and outdated to hang onto? Save a couple of drawers to make footrests, and add your own personal touch to any armchair. Stain or paint the drawers, stuff them with batting, and staple fabric over the pouf to make a comfy footrest. If you need some extra height, repurpose old dresser legs as your new footrest legs! If you need a place to sit and get work done but are afraid of a traditional desk taking up too much space in your home, a tall, slim desk pushed up against the wall can solve both your problems. Paint a couple of tall and sturdy bar stools, and attach them to a long plank of wood using screws to create a desk to line up on the wall that will be both functional and beautiful. Do you want to know the best part? You will be sure to use your space much more efficiently than you might with a traditional desk. 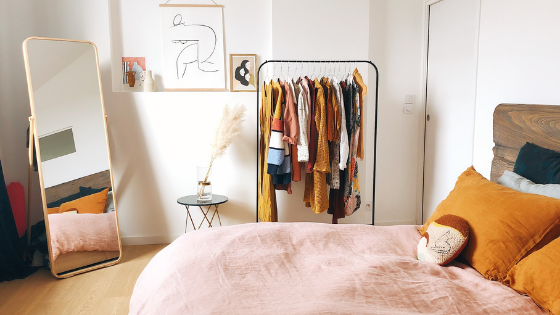 No matter your skill level, you can easily complete any of these DIY furniture projects and make your apartment communicate your style and feel like home. Put your crafting skills to the test by personalizing one of our Chicago apartments to match your style perfectly. Contact us today to explore available floor plans.